Siobhan Curham is an award-winning author, writing consultant and motivational speaker. Her books for young adults are: Dear Dylan (winner of the Young Minds Book Award), Finding Cherokee Brown (shortlisted for Wirral Paperback of the Year), Finding Your Inner Cherokee, Shipwrecked and Dark of the Moon, True Face, The Moonlight Dreamers, Tell it to the Moon and Don't Stop Thinking About Tomorrow (shortlisted for the James Reckitt Hull Children's Book Award and nominated for the Carnegie Medal 2019). Her books for adults are: True Love Always, The Sweet Revenge of the Football Widows, The Scene Stealers, Antenatal & Postnatal Depression and Something More ... a Spiritual Misfit's Search for Meaning. Siobhan has written for many newspapers Siobhan Curham is an award-winning author, writing consultant and motivational speaker. Her books for young adults are: Dear Dylan (winner of the Young Minds Book Award), Finding Cherokee Brown (shortlisted for Wirral Paperback of the Year), Finding Your Inner Cherokee, Shipwrecked and Dark of the Moon, True Face, The Moonlight Dreamers, Tell it to the Moon and Don't Stop Thinking About Tomorrow (shortlisted for the James Reckitt Hull Children's Book Award and nominated for the Carnegie Medal 2019). Her books for adults are: True Love Always, The Sweet Revenge of the Football Widows, The Scene Stealers, Antenatal & Postnatal Depression and Something More ... a Spiritual Misfit's Search for Meaning. 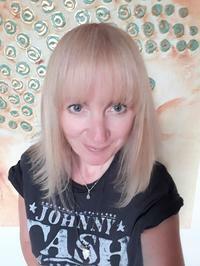 Siobhan has written for many newspapers, magazines and websites, including The Guardian, Cosmopolitan, Writers' Forum, DatingAdvice.com, Mother and Baby, Practical Parenting and Take a Break. She has also been a guest on various radio and TV shows, including Woman’s Hour, BBC News, GMTV and BBC Breakfast.
" Tracy wrote: "You're so right! Thanks for speak up for the snowflakes in the world. I've been thinking about this lately. There is an abyss between ge Tracy wrote: "You're so right! Thanks for speak up for the snowflakes in the world. I've been thinking about this lately. There is an abyss between generations and that difference has been harmful to us. My pare..."
Tracy wrote: "You're so right! Thanks for speak up for the snowflakes in the world. I've been thinking about this lately. There is an abyss between generations and that difference has been harmful to us. My pare..."
" thank you :) x "
We’d love your help. Let us know what’s wrong with this preview of The Anne Stories (Anne of Green Gables, #1-3, 5, 7-8) by L.M. Montgomery. We will contact you via our new email address with the..." ...more "
The second book is four months away. *crawls desperately towards book* I will get there eventually. Oh shipwrecked is a favourite of mine. So much badass gotcha there. Oh Cruz you beautiful man. We’d love your help. Let us know what’s wrong with this preview of Dark of the Moon by Siobhan Curham. Hi Siobhan, remember me? You did an article about me in your self publishing section. Since then I have been signed with 5 Prince Publishing in the US and this is my first book with them. Next one out May 14th How to Have an Amicable Divorce. I've been keeping an eye on your writing career as well.